Swiss researchers have found that the way methane molecules vibrate when they hit a nickel surface can have a huge effect on their reactivity. Steam reforming of methane is one of the oldest large-scale industrial chemistry processes, and is used to make syngas; a mixture of hydrogen and carbon monoxide and the starting point for many industrial processes. This process currently produces nearly half of the world's hydrogen, and as hydrogen is increasingly becoming of interest as a fuel, it is important to be able to make the reaction as efficient as possible by improving the interaction between the metal catalyst used and the methane gas molecules. The activation of the methane C-H bond is the rate-determining step in this process, so understanding this process is key. Methane molecules only stick to the surface if their translation and vibrational energy when they hit the surface is enough to overcome the activation energy barrier for this. Scientists know that how the molecules are aligned is important for the collision and subsequent reaction at the surface, but until recently it was only possible to study this in molecules with permanent dipoles, which methane does not have. Rainer Beck and his colleagues at the Federal Polytechnic School of Lausanne in Switzerland used a powerful new laser to prepare methane molecules in specified energy states. They could dictate both the direction the C-H bonds within the molecules vibrated (parallel or perpendicular to the nickel surface) and the vibrational energy of the molecules. When the researchers measured how much carbon was deposited at the metal surface after the methane and nickel had reacted, they found that methane molecules that had been vibrating parallel to the surface were up to 60 per cent more reactive than those vibrating at right angles to it. Geert-Jan Kroes, a theoretician working on similar problems at Leiden University in the Netherlands, believes that the work represents 'a marvellous achievement and poses a big challenge to theoreticians.' He thinks it may be necessary to use more complicated models than those currently used to explain the new observations. Jörg Libuda, an expert in reaction kinetics at Erlangen University, Germany, notes that while what Beck and his team observe is 'nice', it is only a starting point. 'The challenge is to connect theory and experiment,' he says, and only when the process is fully understood can it be improved. Microscopic jet engines powered by an enzyme that makes bubbles of oxygen from hydrogen peroxide fuel have been developed by chemists in Germany. They can zip around in solution up to ten times faster than equivalent engines using platinum catalysts, and could be used to power tiny machines shunting cargoes. Samuel Sanchez and colleagues from the Leibniz Institute for Solid State and Materials Research in Dresden made tubes from alternating thin layers of titanium and gold that roll up into tubes. 1 They then attached catalase enzymes to the gold interior. Catalase normally protects cells from the toxic oxidative effects of hydrogen peroxide by converting it to oxygen and water, Sanchez explains, so the catalase inside the microengine tube quickly starts to make bubbles of oxygen, which propel the tube, feeding more H2O2 fuel into the front end. In another paper published in June this year,2 the team made tubes with platinum and iron layers inside rather than gold. The Pt can also convert hydrogen peroxide to oxygen, and the iron layers allow the jets to be steered using a magnetic field and push around objects like polystyrene beads. 'The catalase tubes are much more powerful,' says Sanchez, 'they go at the same speed with one tenth as much fuel.' He adds that they have almost managed to combine the two ideas, to make enzyme-powered engines that can be magnetically steered. Making engines that work at low fuel concentrations is vital for any applications, especially in biological systems, Sanchez points out. 'Up to now people were using 10-15 per cent solutions of peroxide, which is very toxic. Now we can use 1.5 per cent, which is still toxic for some cells but it's a big step in the right direction.' He adds that eventually they would like to develop engines that use glucose as fuel, since it is more widely available in biological environments and non-toxic. Tom Mallouk from Pennsylvania State University, US, thinks that the work is significant for several reasons. He explains that the bubble propulsion mechanism avoids some of the problems that other groups, including the catalytic motor team at Penn State, have encountered in trying to make similar microengines. Scientists can now see atoms reacting on the femtosecond timescale in unprecedented detail, thanks to a technique developed at the University of Ottawa. Canadian scientists have observed the photodissociation of bromine molecules using femtosecond laser spectroscopy. They can follow the extreme ultra-violet (EUV) radiation that the laser causes the dissociating molecules to emit down to accuracies of 0.5 attoseconds, or 5x10-19 seconds. 'We can see the atoms move and we can tell where they are at different times,' said Paul Corkum, who leads the Canadian National Research Council's femtosecond science groups. 'We measure everything we could possibly know, and we've made an incredibly sensitive technique,' he says. The Ottawa team uses an intense femtosecond laser to rip electrons away from their atoms, and then force them back in. As the electrons recombine with their atoms, they emit EUV light in a process known as high harmonic generation. 'The process happens really, really fast so that everything is frozen in that time, except the motion of the electron,' Corkum explains. However the laser is not selective in which atoms it interacts with. If only a few molecules in the sample being analysed are dissociating, this means that the resulting emission can contain a very weak signal from the reaction. Corkum and colleagues have now been able to isolate this weak signal, thanks to the fact that the different light waves emitted by the molecules are coherent - that is, that their relative phases remain constant. They can therefore interfere, with the signal from the unreacting molecules creating a fixed background to watch the dissociation against. 'We only trigger just a few molecules to undergo a chemical reaction,' Corkum explains. 'The fact that the light they emit is perfectly coherent allows us to see a weak signal in the presence of many, many, unexcited molecules.' The team is now investigating more complex systems using the same approach, but Corkum hopes the technique will also be useful to other chemists. 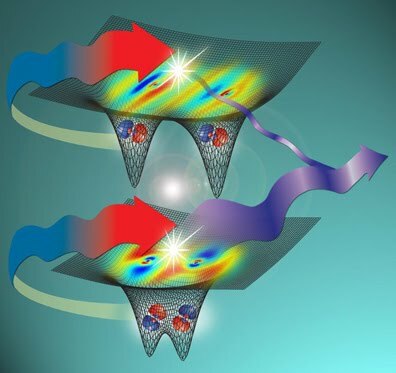 Stephen Leone, director of the chemical dynamics beamline at the US Lawrence Berkeley National Laboratory, says that the approach could help to unravel electronic orbital dynamics during molecular dissociation. 'The interpretation of time-resolved high harmonic spectral signals, once they become routine and applicable to larger systems, will be a powerful addition to the arsenal of dynamical techniques used to study molecular electronic processes,' he added. A US company developing a novel way to convert carbon dioxide into plastics is one of six firms receiving a total of $106 million (£68 million) in government funding as the US pushes research converting captured waste carbon dioxide into useful products. 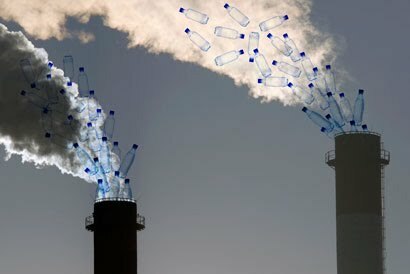 Massachusetts-based Novomer has received $18.4 million from the US Department of Energy (DOE) to develop a process for converting carbon dioxide into polycarbonate polymers that could be used to make plastic bottles. Since its formation 4 years ago, Novomer has been developing a way of reacting traditional epoxide feedstocks with carbon dioxide from industrial waste streams to form plastics that contain between 40 and 50 per cent carbon dioxide by weight. The company uses a catalyst technology developed by Geoff Coates at Cornell University in New York, US, and employs a cobalt catalyst which chief executive Jim Mahoney says is fairly straightforward to synthesise despite being a relatively complex organometallic compound. Using the catalyst technology, Novomer can form both high molecular weight (MW) polymers to make thermoplastic polymers that can be used to make plastics, and low MW polymers that can be used to make resins for use as coatings and adhesives. The technology can also be used to convert carbon monoxide into a range of chemicals such as acrylic acid and 1,3 propanediol. 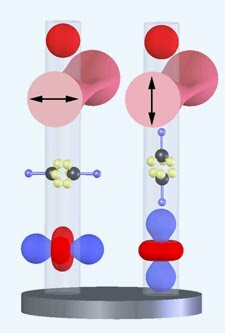 Part of the system's flexibility comes down to the catalyst's ability to work in the presence of a chain transfer agent. 'Putting a chain transfer agent, such as a diol or triol, into the reaction allows us to grow a polymer off each of the agent's OH groups, and by controlling the amount of chain transfer agent added into the reaction we can control the molecular weight of the polymers,' says Mahoney. 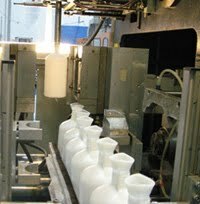 With the help of the DOE funding, Novomer will work with chemical firm Albemarle and the chemicals arm of photographic materials company Eastman Kodak to develop and scale-up its process to make the high MW thermoplastic polymers used to make plastic bottles, films, laminates, and coatings for food packaging. Novomer's most advanced project is the development of low MW polymers for coating and ink resins using carbon dioxide as a raw material - a project Novomer is undertaking in collaboration with Dutch life sciences and materials company DSM. Mahoney predicts the first products from this collaboration will hit the market within the next 2 years. 'We are very positive about this technology because it is so sustainable, but from a cost and performance point of view the technology is also very attractive,' Jan Besamusca, innovation director at DSM's NeoResins+ division, told Chemistry World. The two companies have been working together for over 3 years to develop the technology and in January announced a 'major breakthrough' which has vastly increased the scale and the purity of the production process. According to Besamusca, the advance makes it likely that DSM's customers will start to receive samples for testing in the near future. And he's convinced they'll be pleased with what they receive: 'This generation of polymers is already known from fossil fuel technologies and these polymers have excellent performance characteristics.' A further bonus is the fact that the technology could also 'significantly reduce' the carbon footprint of plastics manufacturers, says Besamusca. 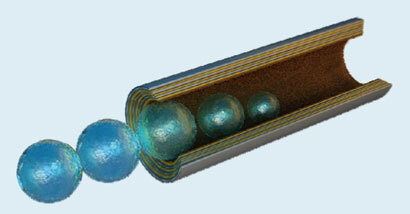 A hydrogel capsule seeks out prostate cancer and releases its contents directly into diseased cells. Prostate cancer is the most frequently diagnosed cancer in men but tracking the progress of the disease is often difficult. A typical diagnosis relies on a blood test for a specific protein called PSA (prostate-specific antigen) in blood, but there is some controversy over the accuracy of these tests, so a biopsy is usually required as well. Now Itaru Hamachi and colleagues at Kyoto University, in Japan, have developed a supramolecular hydrogel that could provide a more accurate way of detecting cancer in prostate glands. The mechanically tough hydrogel made using a glycolipid mimic forms a stable capsule in both aqueous and cellular media. PSA is small enough to diffuse into the hydrogel where it cleaves a prostate cancer targeting compound and a fluorescent biomarker that is co-assembled in the hydrogel, allowing imaging of both PSA activity and prostate cancer cells. Hamachi's material is superior to conventional polymers as it is degradable under biological conditions. Hamachi believes that this kind of supramolecular hydrogel material might be used as an implant after surgery to release a suitable drug around the surgical site and increase the chances of cancer remission.